Mysuru: Is there a larger conspiracy of using Veerayodha A.P. Prashanth Park at K.C. Nagar for commercial purposes by hoodwinking residents of the area? This is a question bothering residents of K.C. Nagar following the Guddali Puja for a Makkala Mantapa (children’s stage) that was performed by Krishnaraja MLA M.K. Somashekar yesterday. The original plan was to construct a Bayalu Ranga Mantapa (open air theatre) at the Park and when the residents opposed it, the authorities changed it to Makkala Mantapa that caters only to the playing needs of the children. Interestingly, the pamphlet announcing the Guddali Puja that was distributed in the entire area states that the puja was for MCC-funded Bayalu Ranga Mantapa. According to Section 6 of Karnataka Parks, Play fields and Open Spaces (Preservation and Regulation) Rules, 1985, no person shall construct any building or put up any structure likely to affect the utility of the park, play field or open space or make any encroachment in or over any park, play field or an open space. Citing the law, residents have now questioned the move to construct a structure inside a park. Today it is Makkala Mantapa and tomorrow many other structures might come up, destroying the peace and tranquillity of the area that is predominantly occupied by retired persons and the elderly, argue the residents. Soon, a food court may appear around the place, they fear. According to the residents, the move to construct a structure by the Residents Welfare Association (Kshemabhivruddhi Sangha) inside the park is fishy and is ultimately aimed at park encroachment in the longer run. They said that any construction will spoil the beauty of the park. Since there is a helipad near the area (Lalitha Mahal Helipad) there will be a constant movement of VVIPs. Any construction activity inside the park is a security risk, said the residents. “This will be a new headache for the Police and personnel manning VVIP security. Moreover, those who are advocating the construction of Bayalu Ranga Mantapa inside the park are far away from the area. Retired employees, students and the elderly live in the locality and construction of a Bayalu Ranga Mantapa will put them in a lot of inconvenience as once the construction is complete, it will be a venue for many public events,” a resident said. The people behind the construction initially distributed pamphlets that a Bayalu Ranga Mantapa will be constructed. “But now the MLA is saying that it will be a Makkala Mantapa and he went ahead and performed Guddali Puja. The MLA does not even know what is required for a Makkala Mantapa and he is misleading the people,” another resident said. At the beginning it will be a stage and next, shops and toilets will be built slowly and the park will ultimately be encroached. “All these are techniques to gobble up the prime land,” another resident said. “We had requested the MLA for a CA site for a community hall to conduct yoga and related activities, but the MLA did not show interest then. Now, why is he suddenly so active?” questioned a resident. 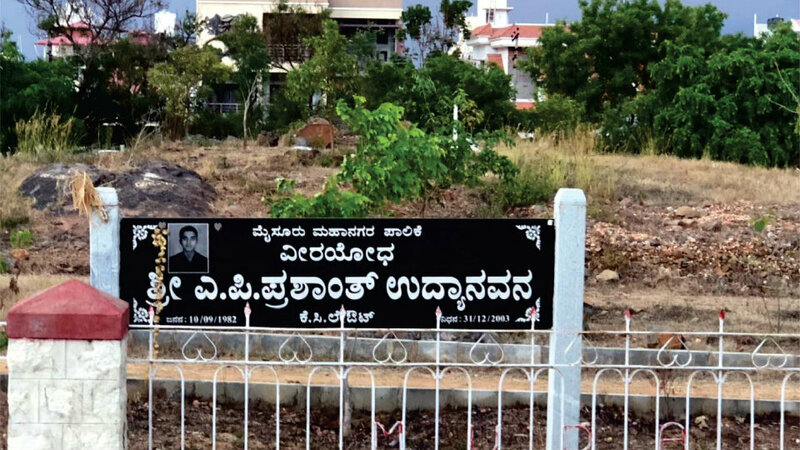 “A former President of the Residents Welfare Association had, without consulting anyone, gave a consent letter for the construction of a church at a vacant plot (that had Veeragallu) on the Chamundi Hill Road. The residents went to the Court and got a stay. If there is any need for a Makkala Mantapa, a separate CA site can be sanctioned for the purpose. But the construction activity inside the park has to stop. Even the MLA must try for a CA site instead of indulging in activities that are against law,” a resident said. The Mysuru City Corporation is spending Rs. 13.50 lakh to construct a Bayalu Ranga Mantapa or a Makkala Mantapa inside a park. However, the residents have argued that instead of wasting so much money, the MCC can install streetlights around the park and improve the park. “These lights can also help late-evening walkers and children who come to the park to play. The roads in the layout also need repairs,” said a resident.